Slipped Disc | A better conductor than Karajan? A better conductor than Karajan? In the ruins of Berlin, the man who restored music making at high performance from 1948 on was the brave and extraordinarily musical conductor Ferenc Fricsay. His first position was as music director of the Deutsche Oper in West Berlin, but it was as head of the US-funded RIAS radio orchestra that he achieved performance standards of a consistency as transcendent, if not higher, than the Berlin Philharmonic. Fricsay fell sick in 1961 and died two years later, aged 48. His Berlin reputation was swiftly eclipsed by Herbert von Karajan. But those who know his work will be in no doubt which gave more valuable service to the city, and which was in most respects the more musical conductor. DG have just issued Fricsay’s collected works. Like so many other gifted musicians – Cantelli springs to mind – he was cruelly taken from us at an early age. Cancer has a lot to answer for. I can only echo Norman’s comments: most of his recordings are of an extraordinarily high quality and tingle with electricity. His Tchaikovsky Pathetique is the fastest I have ever heard but for a sampler of his interpretative insights try his 1953 recording with the Berlin Philharmonic of Beethoven’s first symphony. You will not hear a more joyous, life-affirming performance on disc. Let’s compare what can be compared. Fricsay at 48 and Karajan at 48. In 1956, when he was 48, Karajan was doing wonderful things in London and Milan, as his recordings of that time (public and private) can testify. All the rest is speculation. Glad for the heads up for the Fricsay set, but using the moment as a chance to bash Karajan is really silly. It just detracts from the joy of discovering Fricsay. Why should anybody be better than anybody else? They were lucky back then to have both in Berlin, weren’t they?…. …they were, and are still lucky today for having Simon Rattle ( BPO ), Daniel Barenboim,( Staatskapelle ), Ivan Fischer ( Konzerthaus ) , Marek Janowski, ( RSB ) and Tugan Sokiev ( DSO ) in one city. YES! Ah, to be in Berlin–then as now. Great videos. The tempo of Moldau in the video is enough to make the present Early Music “Exaggeratarians” envious. I did not know that Kodály could speak German! Fricsay better than Karajan? Rembrandt better than Rubens? BMW better than Mercedes? Büning better than Lebrecht? When will some people ever learn, that the arts are not sports. If anything, Fricsay was better than Solti who would have stayed in the Decca-roster as an accompanist if only Fricsay had lived longer! Watch that timpanist going for it at the end. Great. Invigorating and uplifting. With the possible exception of Leopold Stokowski, Ferenc Fricsay was the most accomplished recording conductor of the analogue era. He understood the medium of recording, its possibilities and constraints, as no other conductor did. This sets him appart from Karajan: the Generalmusikdirektor of Europe mastered the media machinery; Fricsay mastered the craft of the electroacoustic tool to perfection. Yes, I agree. I think I recall that Fricsay used a reduced orchestra with speedier tempos than usual to lighten Fidelio up a bit to make it more like the original “theater” performance. Looking at the amazing Hary Janos rehearsal sequences i think little has changed in 50 years..he was a truly modern kind of a conductor, and a genial one..not a show man), but truly dedicated to his art. 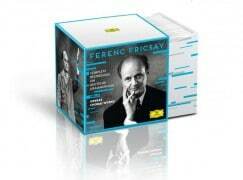 Ferenc Fricsay was a great conductor, with many fabulous recordings to his credit, live, broadcast and studio. It is unfortunate that he was not better known in America. The shortness of his career and life had everthing to do with it. If his health had held-up and one wishes to speculate, it is not difficult to imagine Ferenc Fricsay as successor to Fritz Reiner as conductor of the Chicago Symphony Orchestra or to Munch in Boston. Karajan was also a great conductor and orchestra builder, and achieved marvels during a long career. I was lucky to hear Karajan and the BPO in person quite a few times, even two complete Brahms cycles at different points in his career, but Fricsay never in person. Comparisons like the one proposed here are silly at best, at worst, underhanded attempts to bash Karajan, yet once again, usually for non-musical musical reasons. I have come across such antipathy many times. It never has anything to do with music. Whoever initiated the question should be condemned and dismissed. The intent is evil. For those who do not know, Fricsay was superlative in Bartok, Kodaly, Mozart (a wonderful Don Giovanni), in Verdi (a marvelous Verdi Requiem, particularly the live version with Oralia Dominguez), etc., at home in the concert platform as well as the opera pit. There are conductors who unfortunately left us much too early: Guido Cantelli, Istvan Kertesz, Ataúlfo Argenta, Eduard van Beinum, a little older but still, the great Dmitri Mitropoulos (if there was a Mahler pioneer in America it was Dmitri Mitropoulos: the first Mahler Festival ever held in America was organized and mostly conducted by Mitropoulos with the New York Philharmonic, an orchestra already honed to play Mahler also by the frequent guest appearances by Bruno Walter, all this before Bernstein’s time). There are many career appraisals unjustly distorted by commercial interests of recording companies and the ambitions and careerism as well as the self-effacement and ineptitude at self-promotion of different conductors. Such accidents of publicity, in the final analysis ought not to detract from the greatness of Karajan nor that of Fricsay. One should regard questions as the one posed here with absolute disdain. In the long run, the great ones stand out, and it takes more than a couple of old black-and-white video clips to make any kind of case. Karajan proved his mettle with an almost unbelievable number of recordings; the musicality and performances are beyond reproach in so many of them it is hard to keep count. He was one of the all-time greats. Is it necessary to continue to bash him using any means to do so? And this means no disrespect to Fricsay, who might well have emerged similarly regarded after a greater time on the planet. Why must either lose? This is not a wrestling contest; and anyway, those contests are no less rigged than this sophomoric and insulting article. The writer needs to know something before committing such empty-minded thoughts to the type-pad. There’s something paradoxical about people for whom music criticism is valid enough to induce them to read it saying that comparisons are odious. Or in this case contrasts. It’s true that much of the bias one finds against Karajan has to do with extramusical factors; it has been noted by many that his pursuit of perfectly burnished sound militated against many other desirable aspects of a performance, and tends towards homogenisation. From this point of view, it’s natural to say that Fricsay’s oeuvre is “better”. While it’s true that much of the bias one finds against Karajan has to do with extramusical factors, it has been noted by many that his pursuit of perfectly burnished sound militated against many other desirable aspects of a performance, and tends towards homogenisation. From this point of view, it’s natural to say that Fricsay’s oeuvre is “better”.